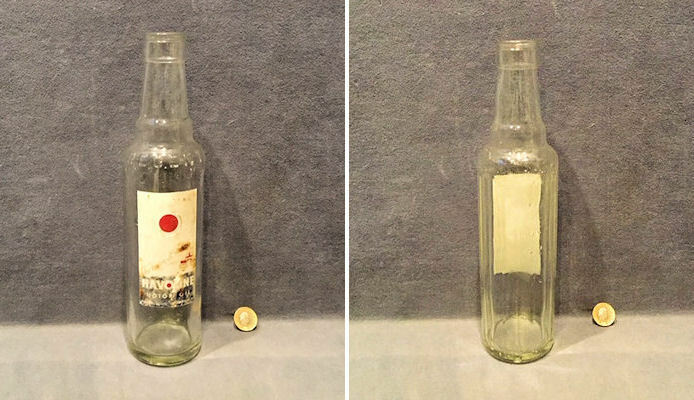 Original, quality 1950's clear glass one pint size motor car oil bottle with the remains of the label to the front for "Haroline Motor Oil, Regent Oil Co Ltd 117 Park St W.I." 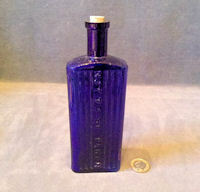 (London) and also embossed to the shoulder "Regent". All is complete and in good order. 11.5" x 2.75". 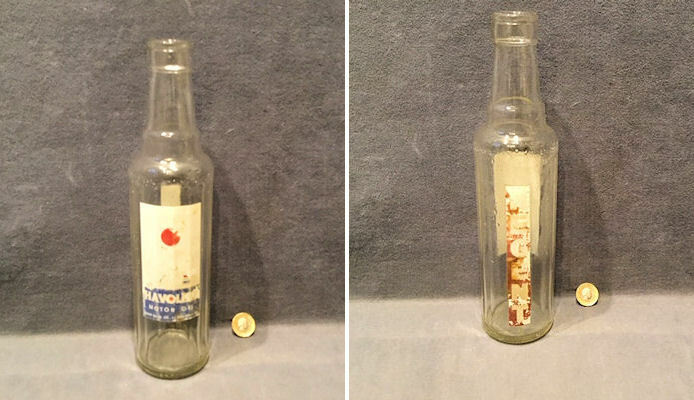 Original, quality 1950's clear glass one pint size motor ca oil bottle with the remains of the label to the front for "Haroline Motor Oil, Regent Oil Co Ltd 117 Park St W.I." (London) and another detail to the reverse for "Regent", otherwise complete and in good order. 11.5" x 2.75". 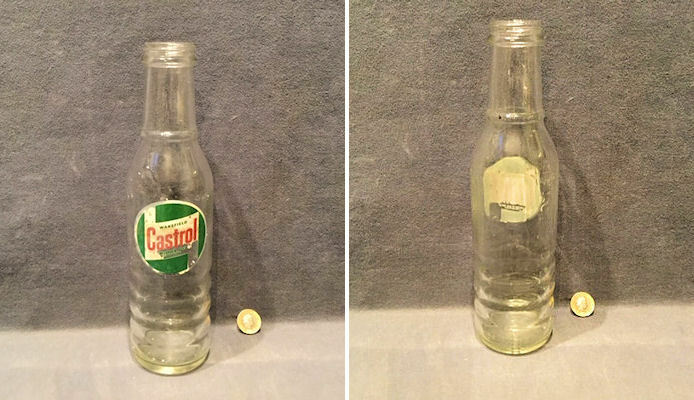 Original, quality 1950's clear glass one pint size motor car oil bottle with the remains of the label to the front for "Wakefield Castrol Motor Oil Patented", otherwise all is complete and in good order. 10.5" x 2.75". 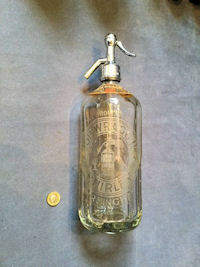 Original, quality 1950's clear glass one pint size motor car oil bottle with details to the front for "Royal Snow Drift Oil". Complete and in good order. 10.5" x 2.75". 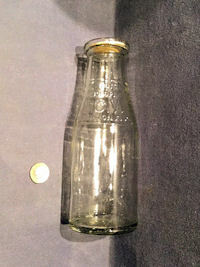 Original, quality 1960's clear glass pint size motor car oil bottle. 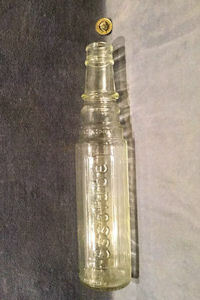 This clear glass bottle is embossed "Essolube" to the front, "Anglo American Oil Co Ltd" to the bottom and the registration number for the year 1933. Complete and in good order. 12.25" tall and 2.75" diam. 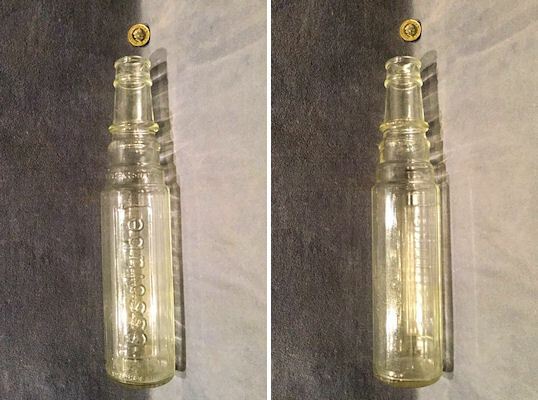 Original, quality late 19th century champagne bottle shaped two tone stoneware ginger beer bottle, transfer printed to the front for the supplier of the original contents "G.O.Andrews, Glasswork Street Kirkcaldy" and impressed for the bottle manufacturer "Buchan Portabello Edinburgh". Odd blemishes to the glazing, otherwise complete and in good order. 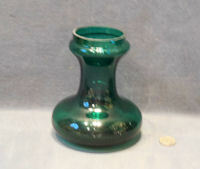 8" tall and 2.5" base diam. 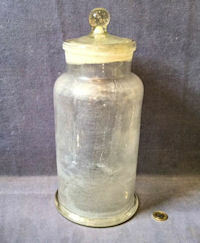 Original, quality late 19th century circular, straight sided two tone glazed storage jar. 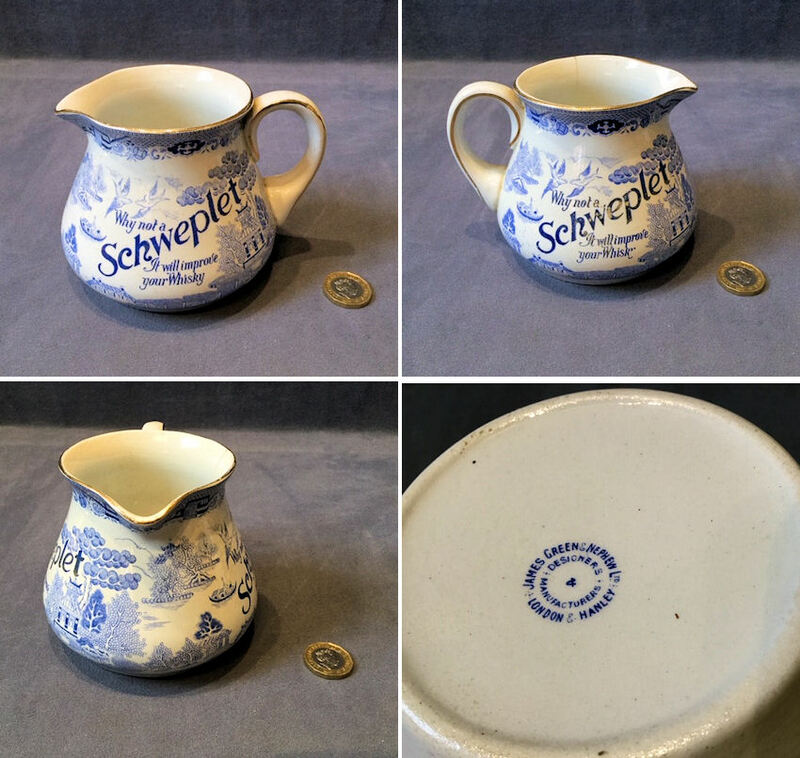 This unusual example is impressed "Ring & Brymer Birch's, 15 Cornhill" and "2qts" to the front and "Doulton Lambeth" to the reverse for the maker. All is complete and in good order. 7" tall and 6" diam. 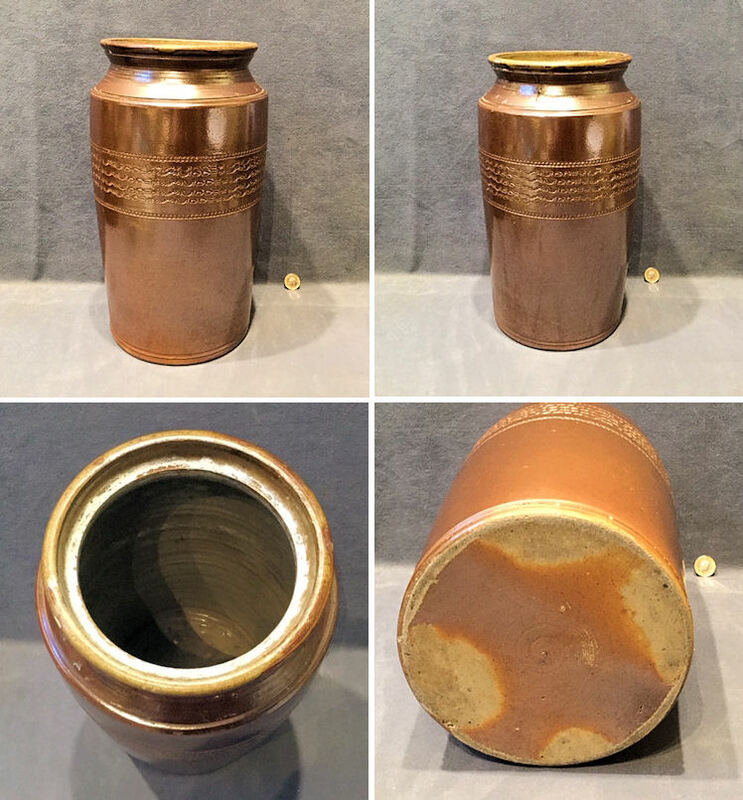 Original, quality late 19th century bellied shaped small two tone stoneware jar, originally sold full of mercury and sealed with a cork. Number '4' impressed to the shoulder for the size. A couple of minor chips to the bottom edge, otherwise complete and in good order. 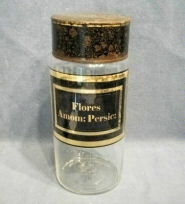 4" tall and 3" widest. 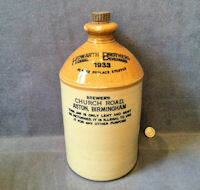 Original, quality two tone glazed stoneware flagon with a strap loop handle to the rear and transfer printed to the front for the supplier of the original contents "Howarth Brothers, Herbal Beverages, Church Rd, Ashton Birmingham" and "1933" and with the original screw in wooden stopper impressed for the same. All is complete and in good order. 11.5" tall and 5.5" diam. 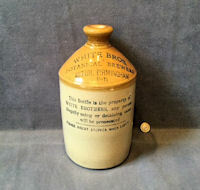 Original, quality two tone glazed stoneware flagon with a strap loop handle to the rear and transfer printed to the front for the supplier of the original contents "White Bros. Botanical Brewers, Ashton Birmingham 1911" and impressed "Pearson of Whittington" to the shoulder for the manufacturer of the flagon. Some blister blemishes to the reverse of the glazed finish, otherwise all is complete and in good order. 10.5" tall x 5.5" diam. 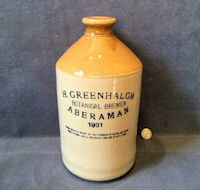 Original, quality two tone glazed stoneware flagon with a strap loop handle to the rear and transfer printed to the front "H. Greenhalgh Botanical Brewer Aberaman 1931" for the supplier of the original contents and impressed "Price Bristol" for the manufacturer of the flagon. Complete and in good order. 10.5" tall x 5.25" diam. 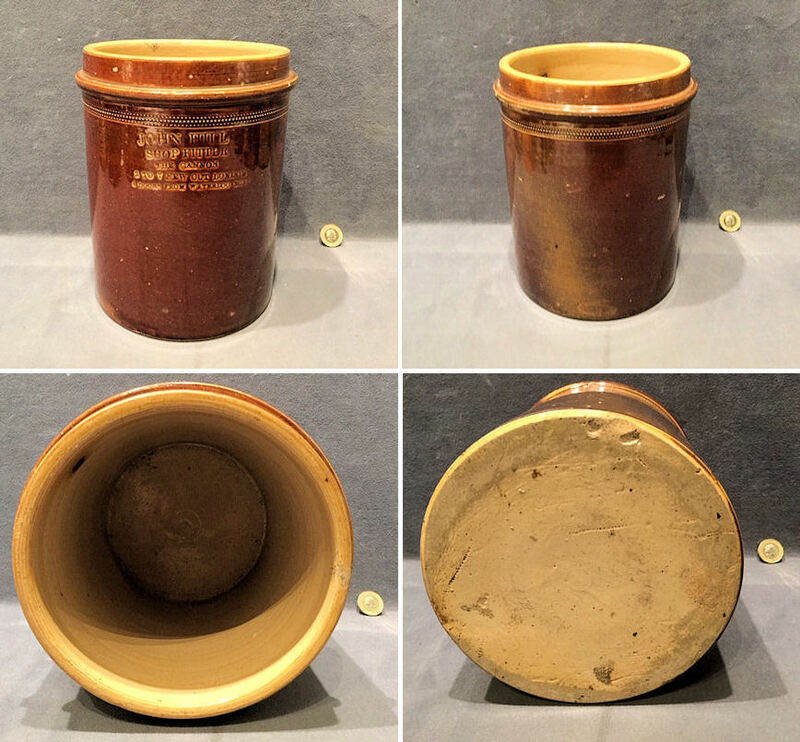 Original, quality pre-war glazed stoneware jar with a coffee coloured exterior and buff coloured interior, glazed inside and out. 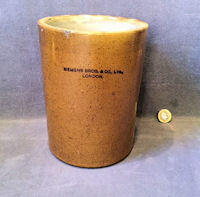 The front is printed "Siemens Bros & Co Ltd London". Complete and in good order. 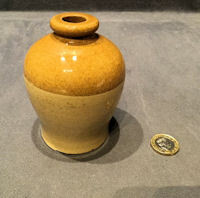 7" tall and 5.25" diam. 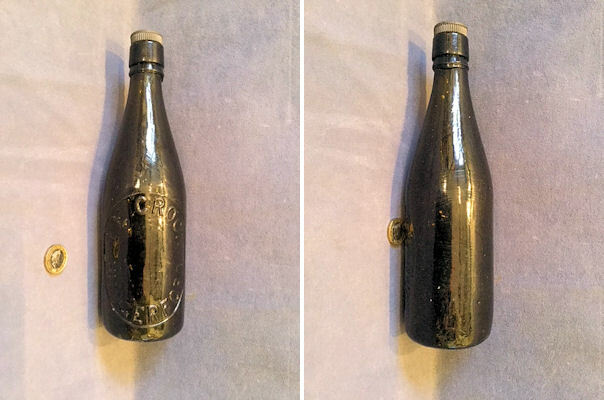 Original, quality, circa 1900, buff coloured stoneware bottle of the beer bottle shape, with the original black composition screw in stopper. The front of this example is transfer printed "Plynine Co Ltd Edinburgh Household Ammonia", the stopper is also marked accordingly and the reverse has "It is illegal for any other than the Plynine Co Ltd to refill this bottle with ammonia". 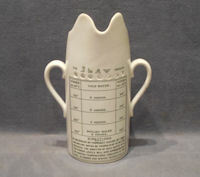 The unglazed ribbed lower section is a warning to the blind or partially sighted that this is not to be drunk. 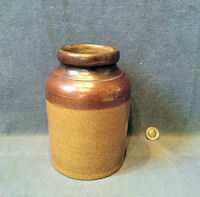 11" tall and 3.25" diam of base. 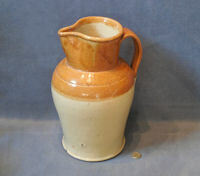 Original, quality two tone glazed stoneware flagon with the original screw in stopper and strap loop handle to the rear. 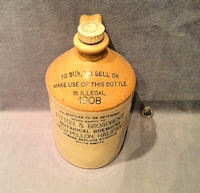 The front is transfer printed "All bottles to be returned empty to Fitton & Broadbent Botanical Brewers, New Pellon Halifax" and "To Buy to sell or make use of this bottle is illegal" and the date 1908. Complete and in good order. 11.5" tall x 9.5" diam. 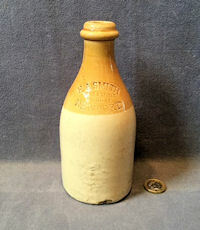 Original, quality late 19th century two tone glazed stoneware bottle. 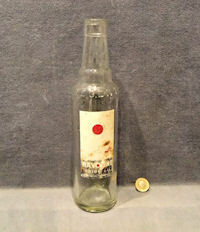 Impressed for the retailer of the original contents "H.A Smith Wine and Spirit Merchant Newport". 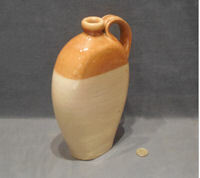 Two firing blemishes to the bottom edge otherwise complete and in good order. 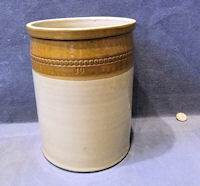 7" tall and 3" base diam. 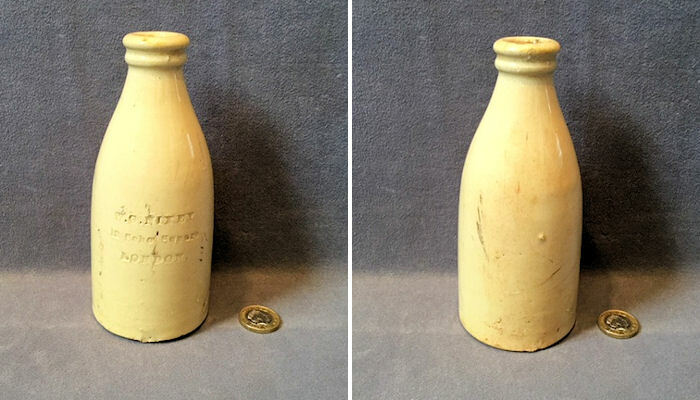 Original, quality late 19th century buff coloured stoneware bottle with incised detail for the retailer of the original contents "W.G. Nixey 12 Soho Square London". Some scuff marks but no damage and otherwise complete and in good order. 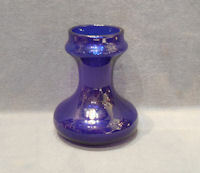 6.5" tall and 2.75" base diam. 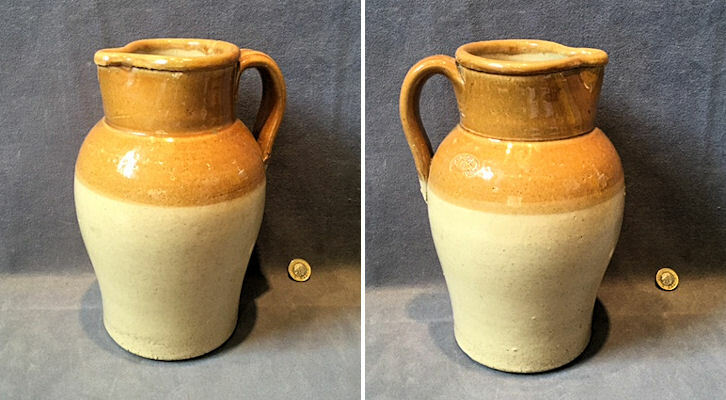 Original, quality late 18th century / early 19th century bellied shaped two tone saltglazed stoneware flagon. 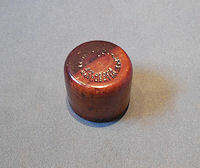 Incised for the supplier of the original contents "J. Challen Marlborough" In Wiltshire. Some minor rubbing to the top and signs of where originally there was a strap handle to the reverse, otherwise complete and in good order. 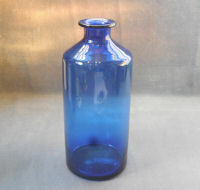 15" tall x 10" widest. 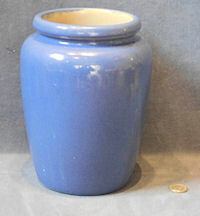 Original, quality 1920's blue coloured glazed "Virol" jar in super condition. These originally had waxed cardboard tops. 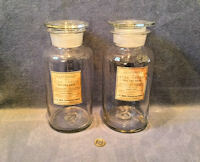 Great for storage jars or vases. Complete and in good working order. 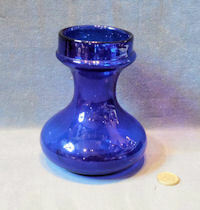 8.25" tall x 6" widest. Price is for each. 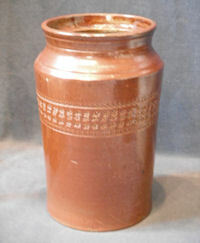 Original, quality, mid to late 19th century, dark brown and glazed stoneware jar, with an impressed decorative frieze to the main body. Some minor chips to the glaze on the lower edge, otherwise complete and in good order. 9" tall x 5.5" diameter. 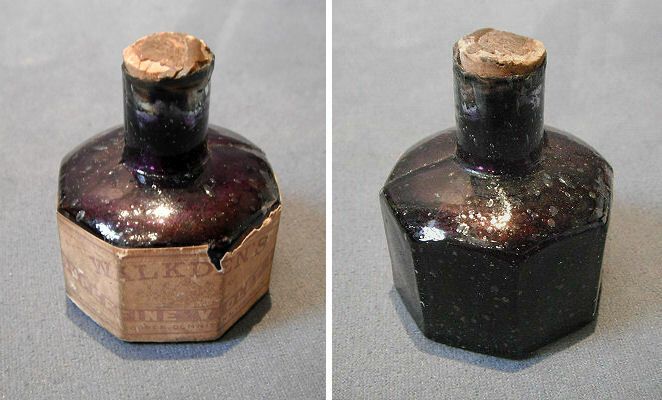 Original, quality, late 18th Century, salt glazed stoneware porter bottles with super original firing blemishes to the glaze. The left hand and right hand, as in the picture, both have a small chip to the bottom edge, otherwise all are perfect as they were fired. 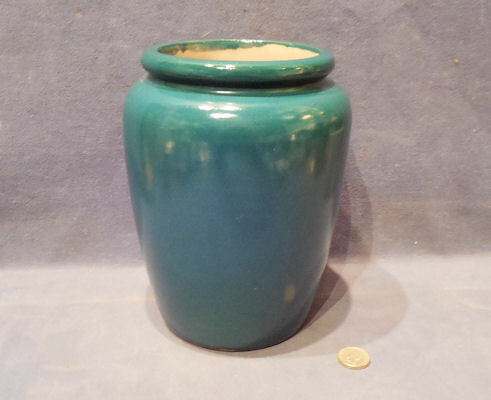 9" tall and 3.5" diameter. Price is for each. 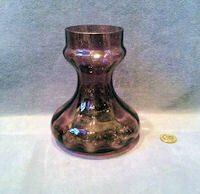 Original, quality 1920's freeblown pale amethyst coloured glass hyacinth bulb vase of the waisted form with vertical ribbing. Complete and in good order. 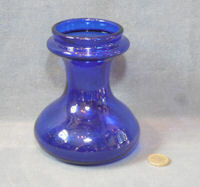 6.25" tall and 5" diam. 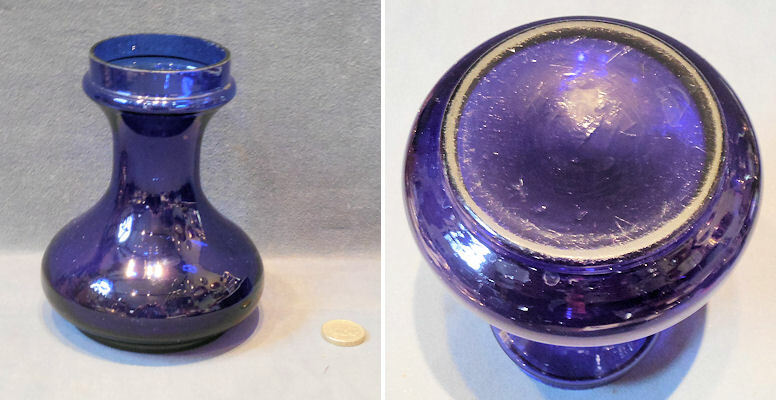 Original, quality 1920's freeblown Bristol Blue coloured glass hyacinth bulb vase of the waisted form, with good wear to the underside and a ground out pontil mark. Complete and in good order. 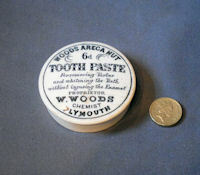 5.5" tall and 4.5" widest. 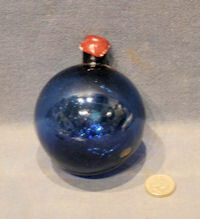 Original, quality 1920's freeblown Bristol blue glass hyacinth bulb vase of the waisted form, showing wear to the underside. Complete and in good and working order. 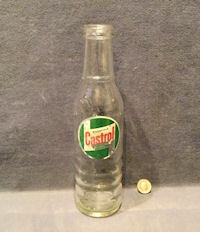 5.5" tall and 4.5" widest. 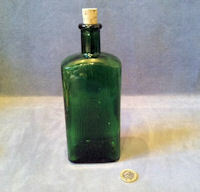 Original, quality 1920's freeblown deep green glass hyacinth bulb vase of the waisted form showing some wear to the underside. Complete and in good order. 6" tall and 5" widest. 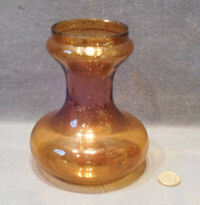 Original, quality 1920's, freeblown amber coloured glass hyacinth bulb vase of the waisted form showing some wear to the underside. Complete and in good order. 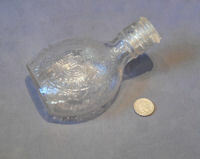 5.5" tall x 4.5" widest. Price is for each. 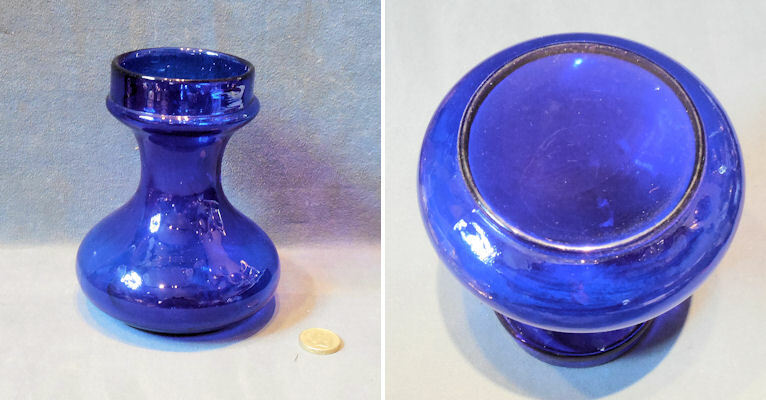 Original, quality 1920's, freeblown Bristol blue coloured glass hyacinth bulb vase of the waisted form showing some wear to the underside. Complete and in good order. 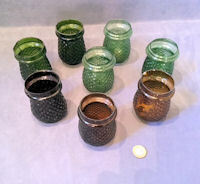 5.75" tall x 4.75" widest.. Price is for each. 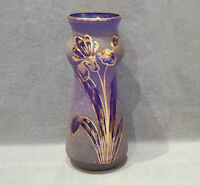 Original, quality pre-war, Bristol blue coloured glass hyacinth vase with a frosted finish and an etched and gilded design of Iris flowers and leaves. A most unusual design. Complete and in good order. 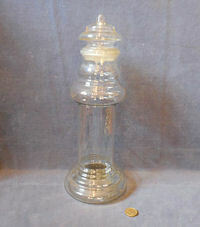 8.5" tall x 3.5" widest. 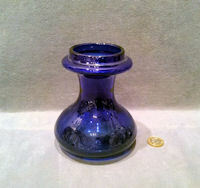 Original, quality 1920's, freeblown blue coloured glass hyacinth bulb vase of the a waisted form showing some wear to the underside. Complete and in good order. 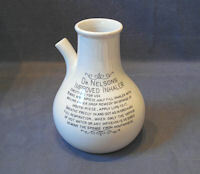 6" tall x 4.5" widest. 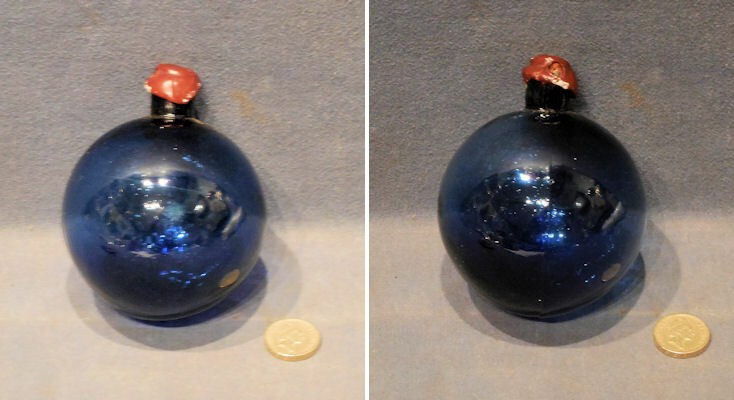 Original, quality 1920's, freeblown Bristol blue coloured glass hyacinth bulb vase of the a waisted form showing some wear to the underside. Complete and in good order. 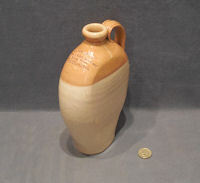 6" tall x 4.5" widest. Original, quality late 19th century to 1920's moulded coloured glass fairy lights with shear tops. 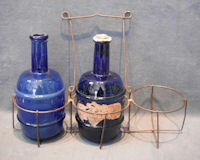 These were used with night light candles floating in water inside and wired hung in bushes in the garden. Assortment of colours as in picture. Complete and in good and working order. 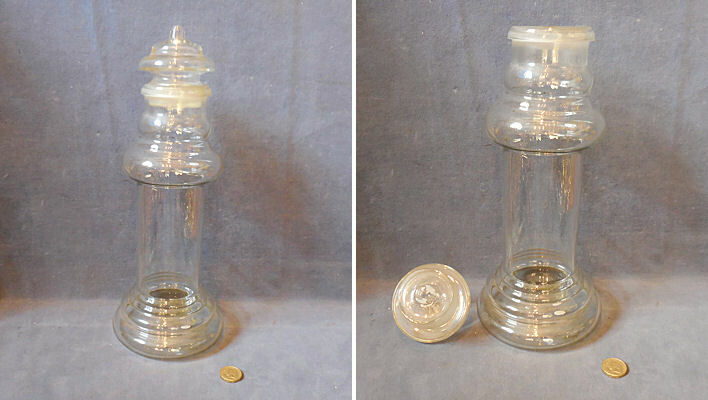 3.5" tall and 2.25" widest. Price is for each. 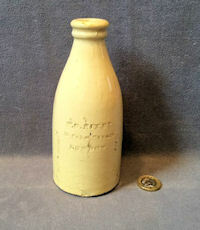 Original, quality 1920's / 30's cylindrical, buff coloured stoneware hot water bottle to be filled with hot water. 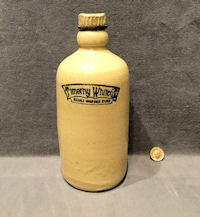 This example has a screw off stopper to the top and transfer printed to the front "Timothy White Ltd Reliable Household Stores". Complete and in good and working order. 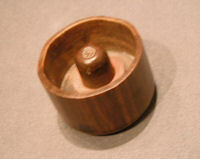 10" x 4" diam. 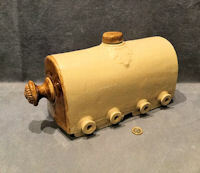 Original, quality 1920's two tone glazed stoneware cylindrical shaped hot water bottle with a brown screw in stopper on a dark brown neck with a buff coloured body. Transfer printed "The Wintawant" to the front and "Bourne Denby England" for the manufacturer to the underside. Complete and in good and working order. 10" tall and 4" diam. 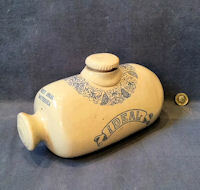 Original, quality 1920's, coffee brown and glazed stoneware hot water bottle. 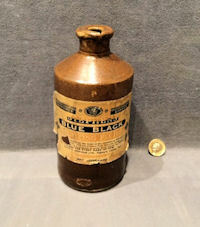 This example is transfer printed to the front "DBC Famous For Value" and has the original black composition screw in stopper. 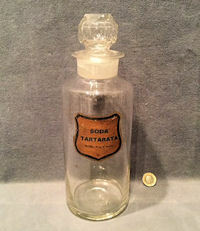 The stopper is embossed "The Domestic Bazaar Co Ltd", so we all now know what 'DBC' stands for. Complete and in good and working order. 10" tall x 4" diameter. 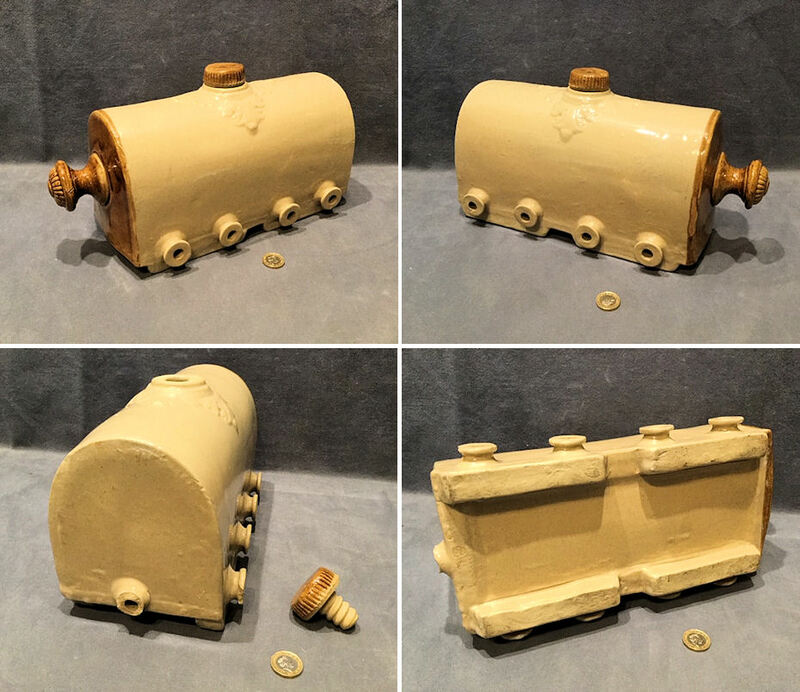 Original, quality, 1920's/30's, flask shaped, buff coloured glazed stoneware foot warmer, with two side loops to the shoulders to attach a carry cord and a screw off stopper. 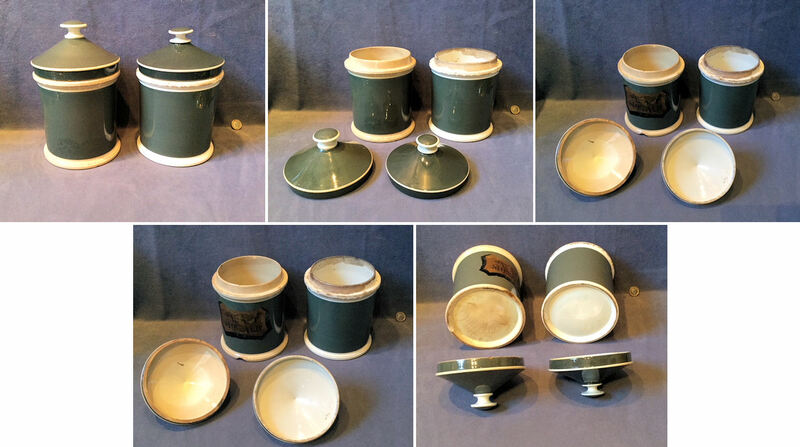 These were filled with hot water and used as bed or foot warmers. Complete and in good and working order. 10" x 6.5" x 2.75". 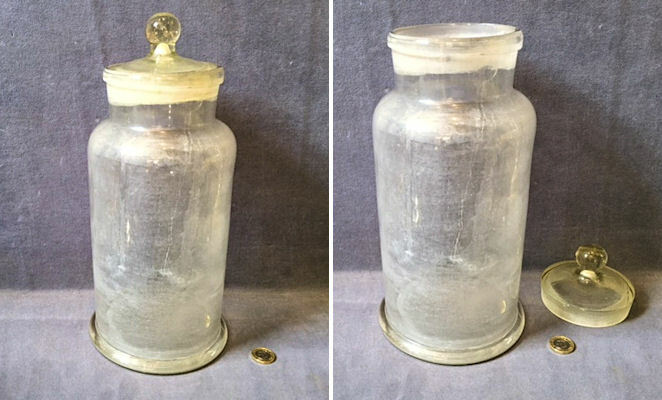 Original, quality late 19th century clear glass water jug with a handle, pouring lip and acid etched engraving of fern leaves around a central oval panel. This panel details "Ryhope and Silkworth, Ind and Prov Society Ltd Christmas 1894". The underside has a super polished pontil mark and wear. 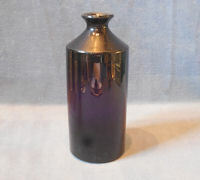 8" tall x base diam 4.25" and 6" front to back including handle. 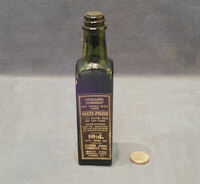 Original, quality pre-war, sealed green bottle of "Grate Polish" with the original very clean label detailing "Collards, Cinderella Liquid Grate Polish 10 1/2d" and instructions etc. Very clean, all original and complete and in good order. 6.75" tall x 1.5" square. 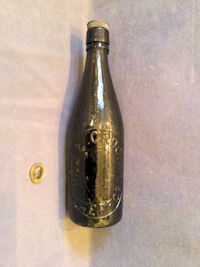 Original, quality 1920's, codd bottle opener turned in lignum vitae, with the original rubber mount. 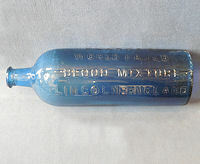 These were used to depress the marble seal in the patent 'Codd' lemonade bottles thus allowing the gas to escape and the marble to fall back enabling the lemonade to be poured. Complete and in good and working order. 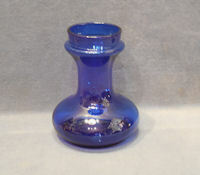 1.75" diameter x 1" tall. 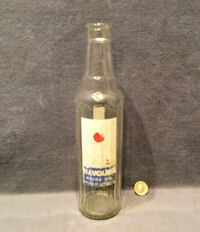 Original, quality 1920's, codd bottle opener turned in lignum vitae. 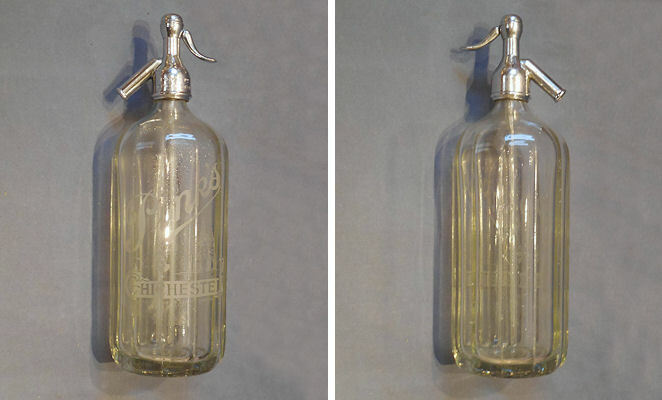 These were used to depress the marble seal in the patent 'Codd' lemonade bottles thus allowing the gas to escape and the marble to fall back enabling the lemonade to be poured. 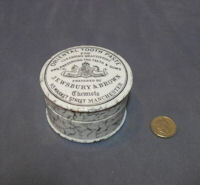 This example is impressed to the top "Brain and Hinchliffe and Sons Manchester" and all is complete and in good and working order. 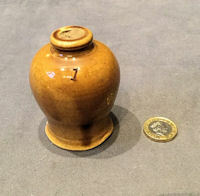 1.5" diameter x 1.25" tall. 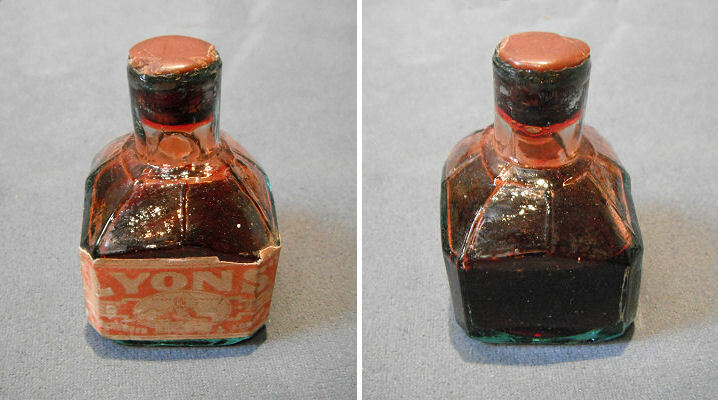 Original, quality mid to late 19th century, flat sided two tone glazed stoneware spirit flask with a strap loop handle to the rear and incised to the front "Stephens and Co Wine Merchants Devonport". 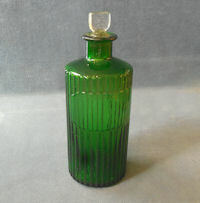 The base is also impressed but for the maker of the flask"Powell Bristol". Complete and in good order. 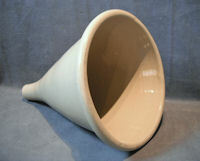 10" tall, 3" widest and 6" front to back. 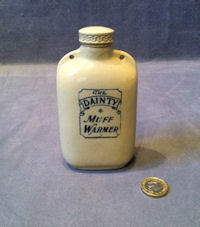 Original, quality, mid to late 19th century, flat sided two tone glazed stoneware spirit flask with a strap loop handle to the rear. 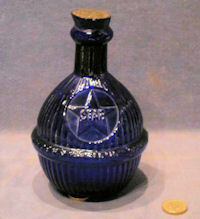 The base is impressed for the maker of the flask "Price Bristol". All is complete and in good order. 10" tall x 2.5" wide and 6" front to back. 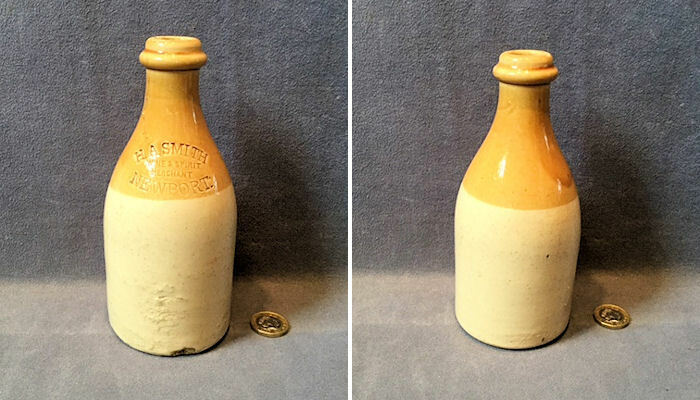 Original, quality, mid to late 19th century, flat sided two tone glazed stoneware spirit flask with a strap loop handle to the rear and incised to the front "James Quick Wine and Spirit Merchant Bridge Street Southampton". 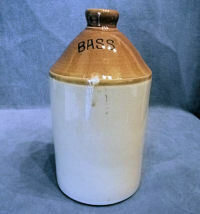 The base is also impressed for the maker of the flask "Price Bristol". 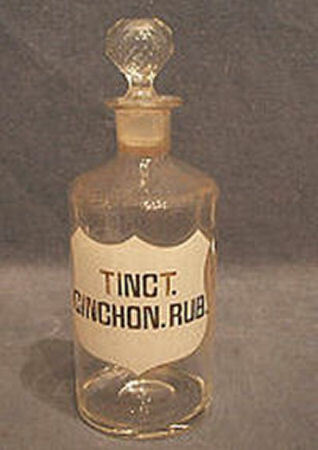 One tiny rub or chip to the inside of the handle otherwise complete and in good order. 8.5" tall x 2.5" wide and 5" front to back. 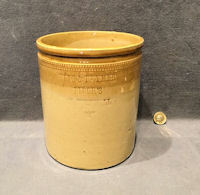 Original, quality late 19th century two tone glazed stoneware straight sided storage jar / tub with an impressed beaded pattern to the upper section. Originally this had a waxed card top. Complete and in good order. 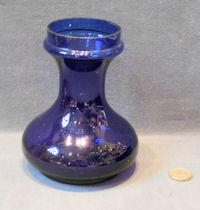 9.75" tall and 7" diam. Price is for each. 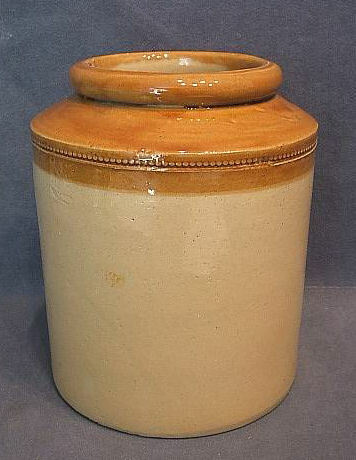 Original, quality mid to late 19th century two tone salt glazed stoneware preserve jar. 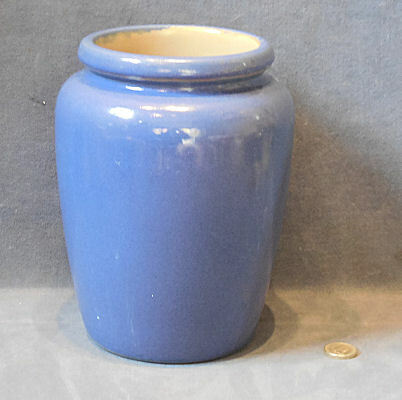 This larger than average jar has chip to the base and stains from 'Isinglass' ( used for pickling eggs), otherwise complete and in good order and a super example.11.5" tall and 8" diam. 3.5" aperture. 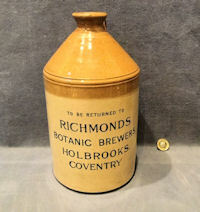 Original, quality late 19th century two tone glazed stoneware flagon with a strap handle to the rear and transfer detail to the front for the suppliers of the original contents "To be returned to Richmond Botanic Brewers Holbrooks Coventry". 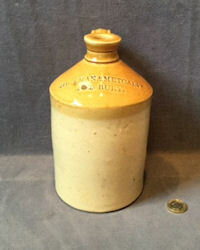 The shoulder is impressed for the manufacturer of the flagon "Doulton & Co Ltd Lambeth". A very clean example. Complete and in good order. 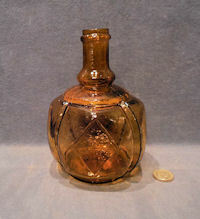 10.5" tall x 5.75" diam. 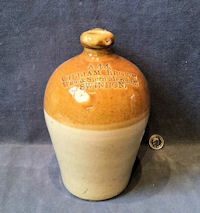 Original, quality late 19th century small two tone glazed stoneware flagon of the bellied shape with a loop handle to the rear and impressed to the front for the supplier of the original contents "William Brown Wine & Spirit Merchant Swindon" and "A44". 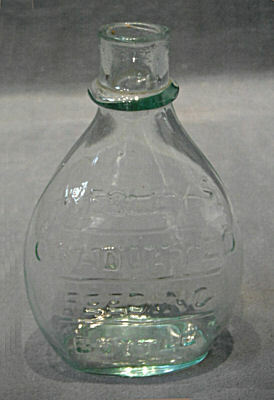 The rear is also impressed for the manufacturer of the flagon "Powell of Bristol". 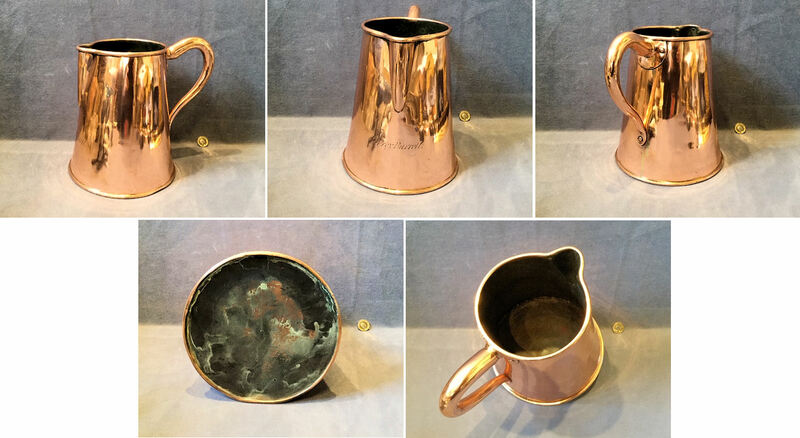 Two firing blemishes, one to the front and the other to the rim of the spout, otherwise complete and in good order. 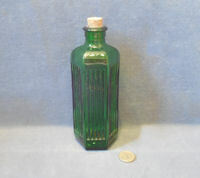 8.25" tall and 5" widest. 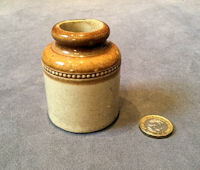 Original, quality mid 19th century salt glazed earthenware preserve jar originally containing jam or preserves. A very clean example with not a chip in sight. Complete and in good order. 7" tall and 4.5" body diam. Clcik on photo for larger and other view. 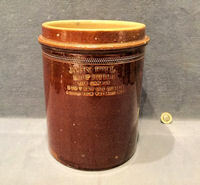 Original, quality mid 19th century salt glazed earthenware preserve jar originally containing jams and preserves. 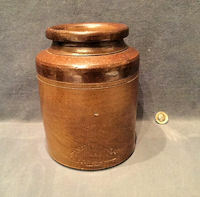 This super example has a semi circular impressed maker's details for "J.Bourne Patentee ? and Godnor Park Potteries Nr Derby, Vitreous Stone Jars". Complete and in good order with not a chip in sight. 7.75" x 5.75" base diam. 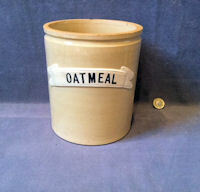 Original, quality 1920's glazed stoneware buff coloured storage jar with an applied white ceramic swag detailing 'Oatmeal' in black text. Impressed to the lower portion for the manufacturer "Bourne Denby" and one minor chip to the top rim. 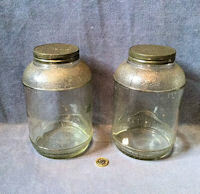 These jars originally had waxed cardboard tops. 7" tall and 6" diam. 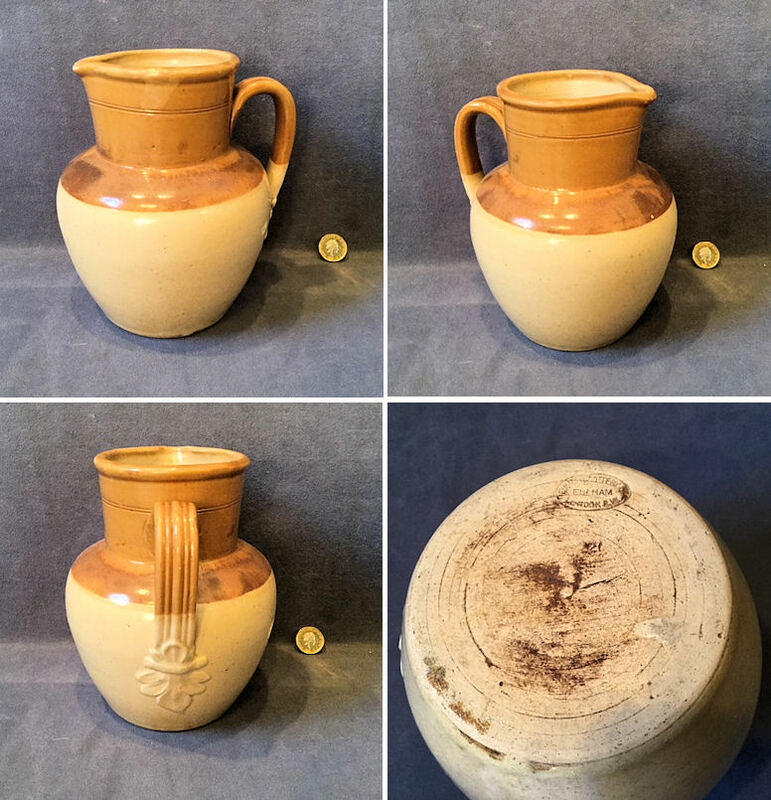 Original, quality late 19th century two tone glazed stoneware flagon of the bellied shape with a strap loop handle to the rear and impressed to the shoulder for the supplier of the original contents"Blake Bros, Wine & Spirit Merchants Langport". 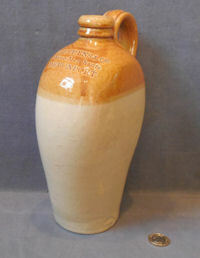 Also impressed to the side for the maker of the flagon 'Price of Bristol'. Complete and in good order. 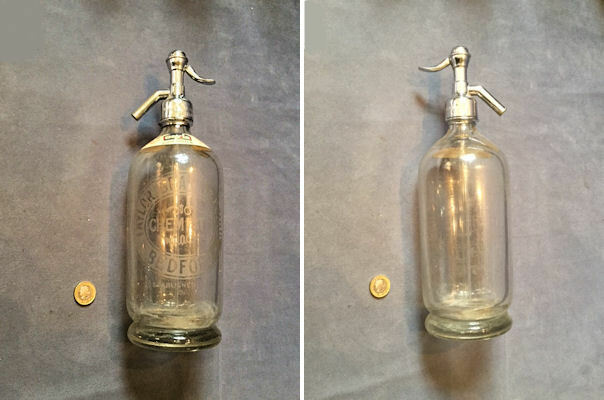 10" tall x 6.5" body width and 6.75" front to back including handle. 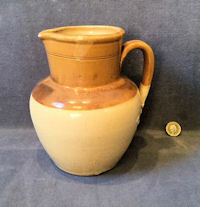 Original quality late 19th Century large flat sided two tone glazed stoneware flagon with a small neck and a strap handle to the rear. 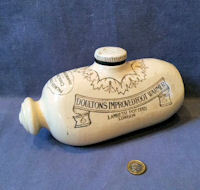 Impressed to the shoulder for the manufacturer of the flagon "Price Bristol". Complete and in good order. 13.5" tall x 6", 8.5" front to back. 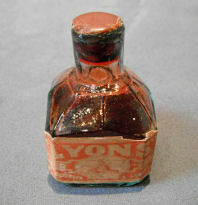 Click on image for larger and other views. 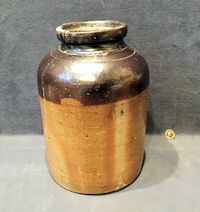 Original quality late 19th century large shop counter two tone glazed stoneware flagon with an aperture for the tap to the front, a screw in stoneware stopper to the top and a strap handle. 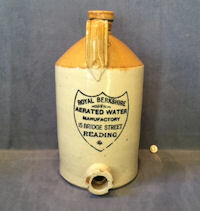 This super example is transfer printed to the front for the supplier of the original contents "Royal Berkshire Aerated Water Manufactory 15 Bridge Street Reading". Complete and in good order. 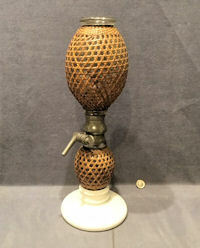 17" tall, body 8.5" diameter, 9.75" front to back including tap aperture. 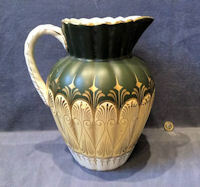 Original, quality small late 19th century two tone glazed flagon with a loop handle to the top, a narrow spout and incised for the supplier of the original contents "Hickman and Metcalf Newbury". All is in super condition apart from a firing blemish on the 'N and E' of Newbury. 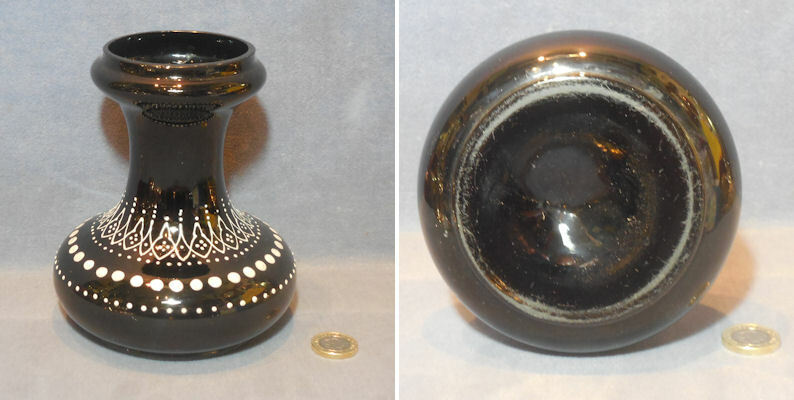 8" tall, 4.5" diam base and 5.25" wide including handle. 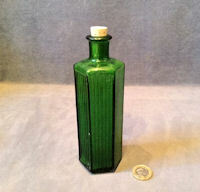 Original, quality 1920's two tone glazed stoneware flagon with a loop handle to the top and a narrow spout to the top. 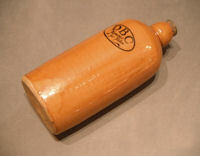 This example is transfer printed to the shoulder "Harrods Stores Ltd, grocery department 87 to 106 Brompton Rd" for the retailer of the original contents and impressed "Skey Tamworth" for the maker of the flagon. Complete and in good order. 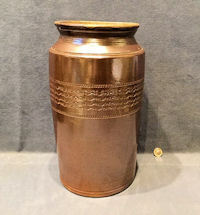 13" tall and 6.75" diam. 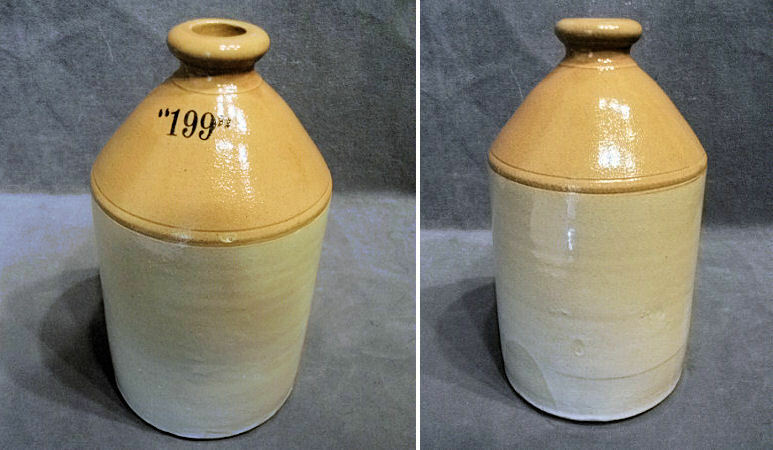 Orignal, quality two tone glazed stoneware flagon of a medium size with a loop handle, and a great deal of transfer printed detail including. " 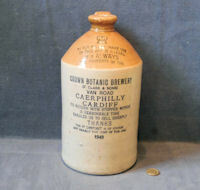 Crown Botanic Brewery ( F Clark and Sons) Van Road Caerphilly Cardiff" for the supplier of the contents and " Id deposit ", " 1940 " and instructions for the return. 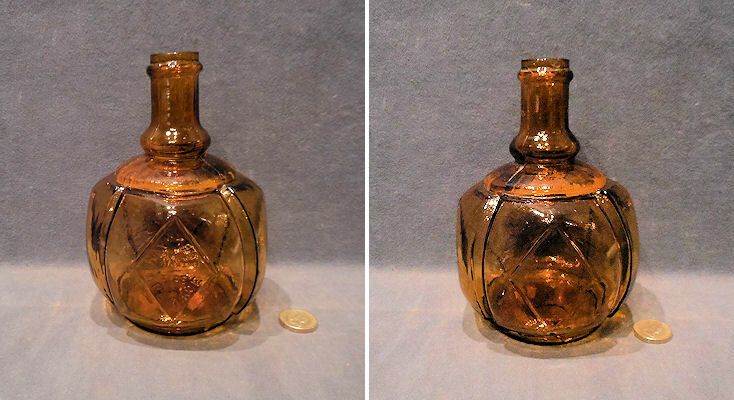 Also impressed to the reverse for the maker of the flagon "Price Bristol". Complete and in good and working order. 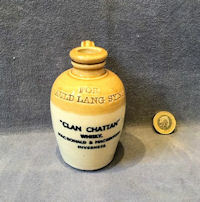 11" x tall and 5.5" diam. 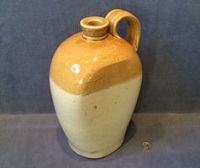 Original, quality, late 19th century, bellied shaped two tone glazed stoneware flagon with a rear strap handle. 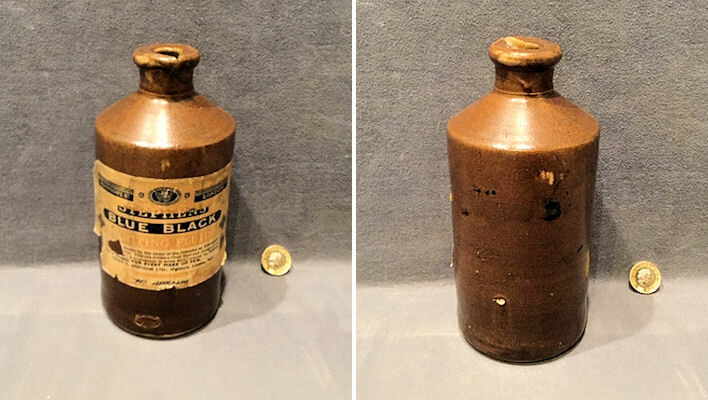 Impressed to the front for the maker of the original contents "John Angus 120 Sauchiehall Street", "29 Norfolk Street Glasgow" and "Murray and Fellar Co Glasgow" the manufacturer of the flagon. No chips or cracks and complete and in good order. 10" tall x 6" widest. 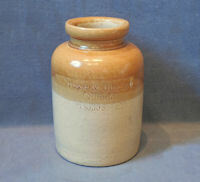 Original, quality, two tone glazed stoneware flagon with a strap handle to the rear and transfer printed to the front for the supplier of the original contents "Joseph Rothwell 29 Sandwell Road West Bromwich" and "1928 This jar is the property of Joseph Rothwell anyone illegally using or detaining same will be prosecuted" and impressed for the maker of the flagon "Skey of Tamworth". Not a chip or crack, complete and in good order. 13" tall x 7" diameter. 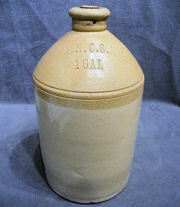 Original, quality, small two tone glazed stoneware flagon in the original basket, circa 1900 / 1920's. 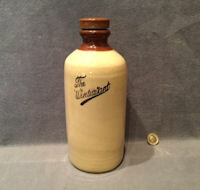 The flagon is impressed for the supplier of the original contents "Whitwell Mark and Co Ltd Kendal". 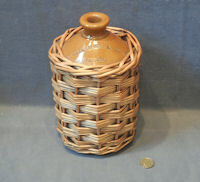 Both the flagon and the basket are in great condition, no chips, cracks or worm. 9" tall x 5.5" diameter. 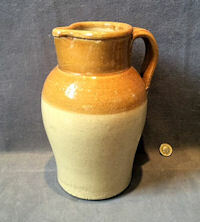 Original, quality, late 19th Century, two tone, glazed stoneware flagon. Incised to the top: 'A. 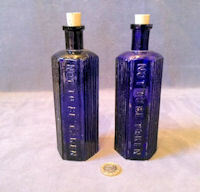 N. C. S. L. 1 Gallon' and 'S999' for the manufacturer of the original contents, and 'Skey Tamworth' for the manufacturer of the flagon. 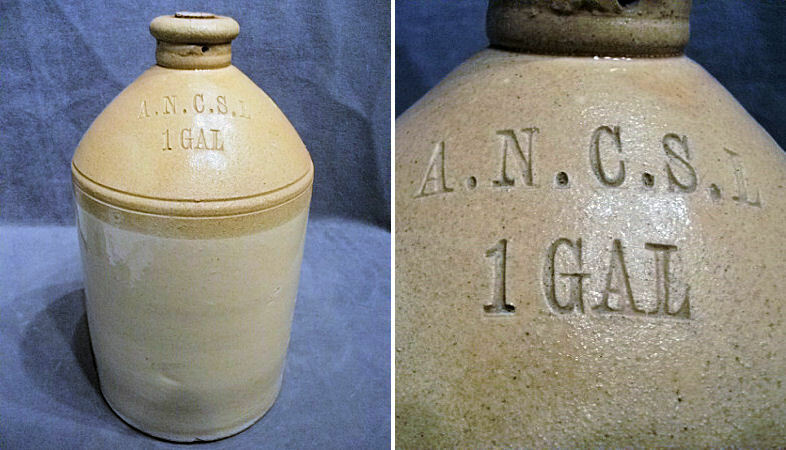 A. N. C. S. L. is for the Army and Navy Co-operative Stores Ltd. Complete and in good order. 7" diameter and 13" high. 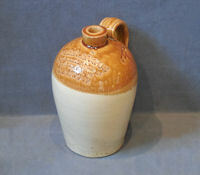 Original, quality, 1920's/30's, two tone, glazed stoneware flagon. 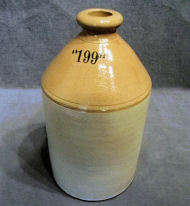 Transfer printed to the front '199'; said to be a brew from Bass? Complete and in good order. 6" diameter and 11" high. Price is for each. 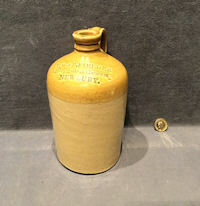 Original, quality, two tone, glazed stoneware flagon circa 1920's/30's, with a loop handle to the top. 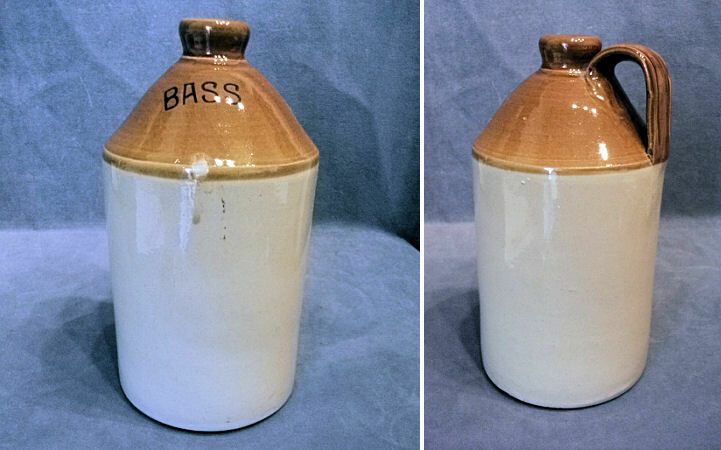 Transfer printed to the front for the manufacturer of the original contents: 'Bass' and impressed for the manufacturer of the flagon ? from Chester. Complete and in good order. 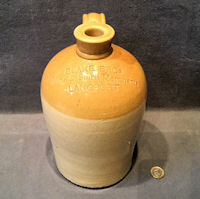 5.5" diameter and 11" high. 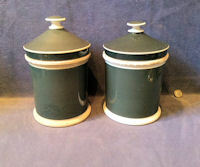 Similar, original quality two tone stoneware preserve jars, circa 1900. 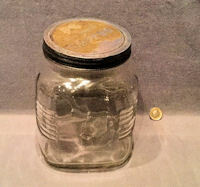 These jars were originally supplied with marmalade and preserves, but are often referred to as salt jars due to their second use in life. 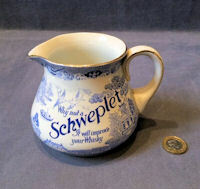 Ideal today for various uses in the kitchen. Complete and in good order. 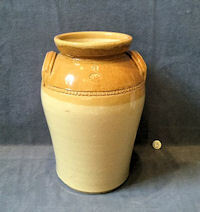 Approximately 8" tall x 6" base diameter. Price is for each. 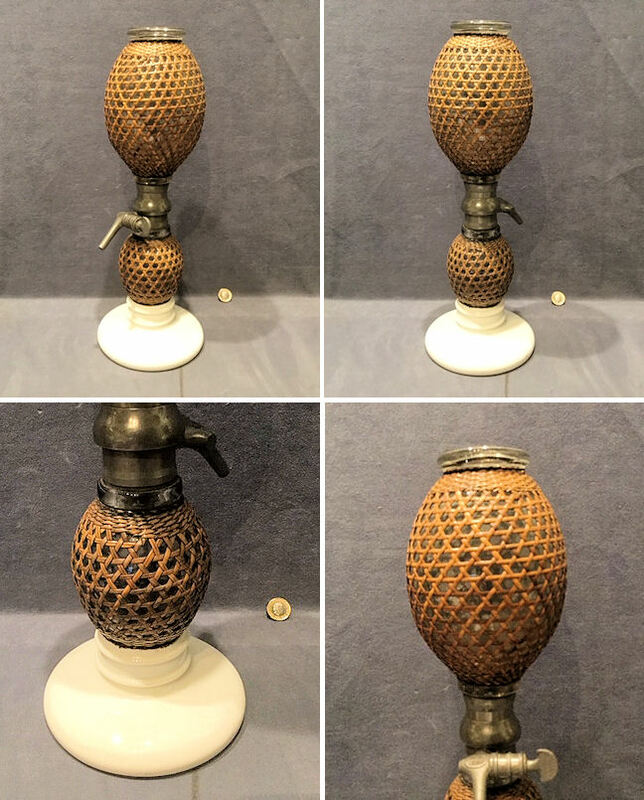 Original, quality 1920's Continental Cane Covered Soda Syphon with two spherical clear glass sections with pewter tap and collars, all standing on a circular white ceramic base. 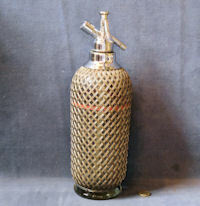 The cane is perfect as is the rest of this super item, the tap is embossed "Briet S.G.D.G. Paris". 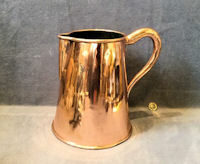 These are difficult to find in perfect condition today, and this one is complete and in good order but not suitable for use. 18" tall and base 6.5" diam. 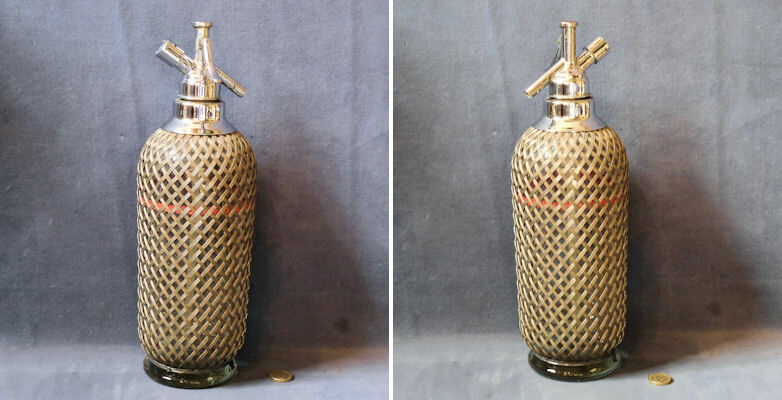 Original, quality 1920's clear glass soda syphon with a chromed top fitting and acid etched to the glass "Taylor Brawn and Flood Chemists Bedford" and similar is impressed to the chrome top mount. 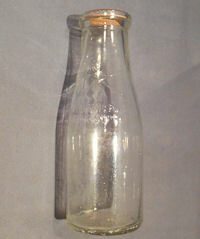 The label to the top for "Dayla Soda Water" is for a later refilling of soda water. Complete and in good order but not suitable for use. 12" tall and 3.5" diam. 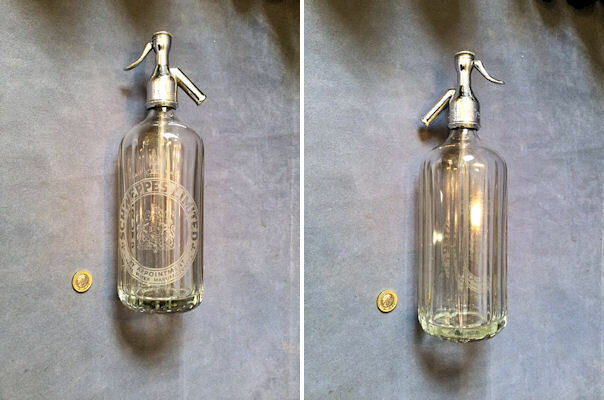 Original, quality 1920's clear glass soda syphon with a chromed top fitting and acid etched to the glass "Schweppes Limited by appointment mineral water manufacturer" and with a Royal Coat of Arms and similar is impressed to the chrome top mount. All is complete and in good order but not suitable for use. 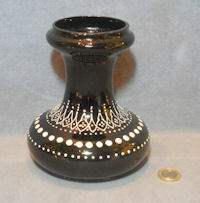 12" tall and 3.75" diam. 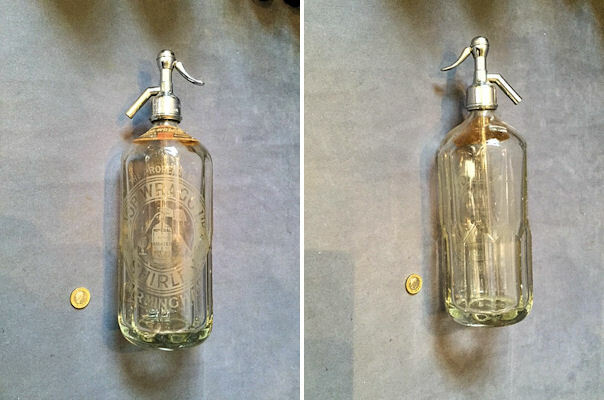 Original, quality 1920's clear glass soda syphon with a chromed top fitting and acid etched to the glass "Job Wragg Shirley Birmingham" and similar is impressed to the chrome top mount. 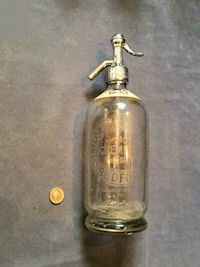 The bonus on this syphon is the original paper label for "Job Wragg Ltd Soda Water" still attached although a little scruffy. 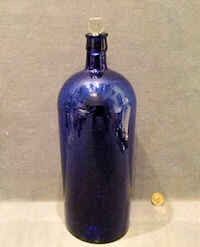 Some minor bruising to the glass on the high points otherwise complete and in good order but not suitable for use. 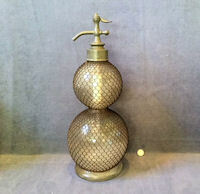 13" tall and 4" diam. 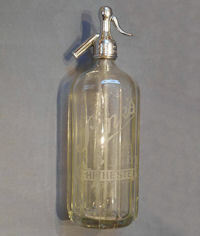 Original, quality 1920's, clear glass soda syphon with a chromed top fitting, acid etched to the front "Pinks Chichester" for the supplier of the original contents with the same impressed to the chrome top. 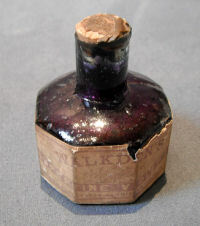 Complete and in good order, but not suitable for use. 12.5" tall x 4.25" diameter. 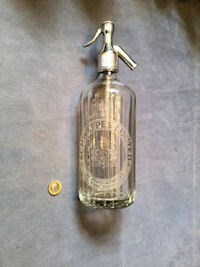 Original, quality 1920's, clear glass soda syphon with a chromed top fitting and acid etched to the front "W.Westwell Stalybridge" for the supplier of the original contents and "British Syphon Co London" for the manufacturer of the bottle. Complete and in good order, but not suitable for use. 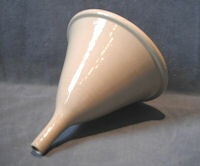 12.5" tall x 4" diameter body.